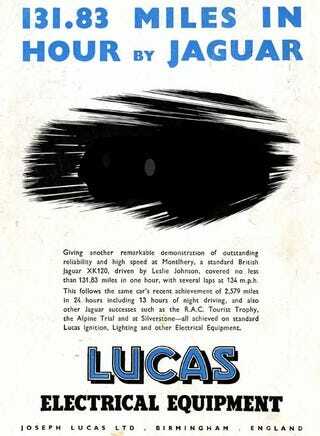 We like to tell British car jokes, but the best ones tend to focus on the maker of notoriously unreliable electrical components for those cars: Lucas Electrics aka The Prince Of Darkness! If It Runs, Sell It: More British Car Jokes! Lucas Electrical Components advertised heavily in Autocar magazine in the early 1950s, so I've scanned a quartet of their ads from that era. Your job: to modify one or more of the chosen ads in the most entertaining fashion you can manage; I've primed the pump with a lame-o version that took me all of 45 seconds to create (see above). Don't worry about the challenges of extracting the images from the clutches of the Gawker Server Hamsters' galleries, because you can download hi-res versions of the ads from the MurileeMartin.com webserver. So, what do you win? Hey, when we promise fabulous prizes, we deliver; the best Prince Of Darkness Photoshopper (or GIMPer, or Irfanviewer, or whatever image-modifying tool you prefer) will get a copy of this fancy coffee-table book about Dean Jeffries! Email me your entries, and I'll put the best ones in a post later on.